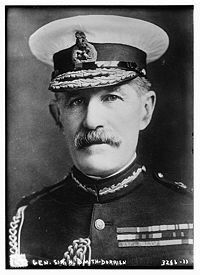 In the morning on 26 August, the Germans arrived and heavily attacked the British forces commanded by General Sir Horace Smith-Dorrien. 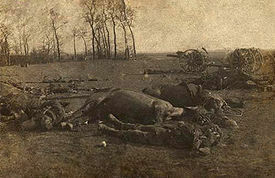 Unlike the Battle of Mons where the majority of casualties inflicted by the British were from rifle fire, Le Cateau was an artilleryman's battle, demonstrating the devastating results which modern quick-firing artillery firing airbursting shrapnel shells could have on infantry advancing in the open. Holding their ground tenaciously against superior odds despite taking heavy casualties, by the mid afternoon, the right, then left flanks of the British, began to break under unrelenting pressure from the Germans. The arrival of Sordet's French cavalry acted to shield the British left flank, and supported a highly-co-ordinated tactical withdrawal despite continued attempts by the Germans to infiltrate and outflank the retreating British forces. Smith-Dorrien's II Corps took the brunt of a heavy assault by the German forces at Mons, with the Germans under von Kluck attempting a flanking manoeuvre. French ordered a general retreat, during which I Corps (under General Douglas Haig) and II Corps became separated. Haig's I Corps did not reach its intended position to the immediate east of Le Cateau.